There are many ways to light in a timely manner, simply by lamps that plug into the wall and placed on tables or on the ground, gaining in clarity rooms and the decor is greatly improved. But where there are few outlets (older homes, bathrooms, kitchens) and not be comfortable walking placing lamps, LEDs come to our aid. The acronym LED stands for Light Emitting Diode (light emitting diodes), and increasingly, these lamps are “invading” the market by its advantages. Give much light, there is in many colors, just waste energy, s on environmental and offer many decorative possibilities. Although the LED lamps sold many brands, Osram is putting the house on the market the most interesting articles. First came the Dot-IT luminaries, which could put even under water, and now surprise us again with the LEDStixx. This is a multi-linear lamp, with its four white LEDs provides immediate clarity to any point on the homes. In addition, this curious fixture requires no installation or plug it anywhere, just “paste” in which we are interested in using your magnet or adhesive. There is also the possibility of screw, if we want to be better secured. 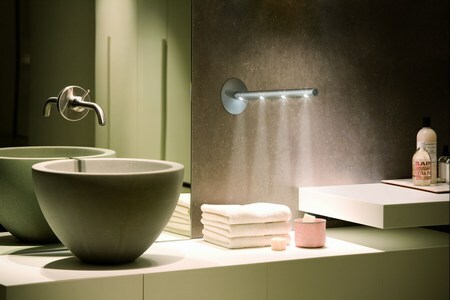 This entry was posted in Accessories, Bathroom and tagged bathroom decor, bathroom design idea. Bookmark the permalink.